In and around Nîmes are some of the finest and best preserved Roman monuments. The most complete Roman temple. 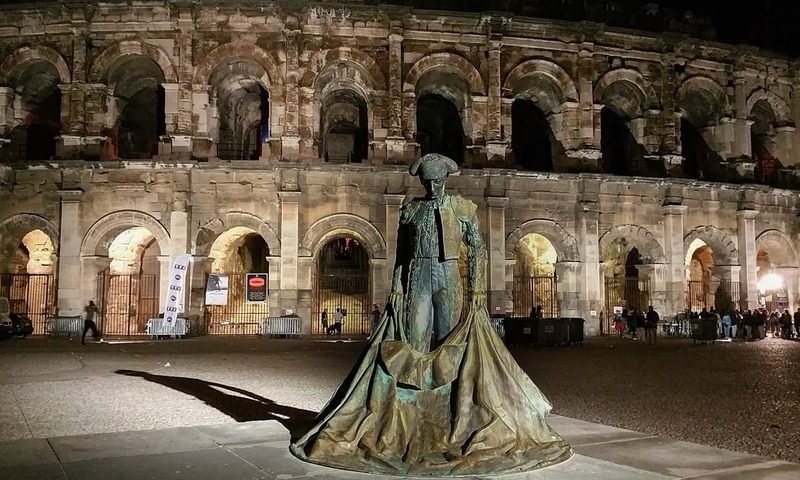 Although the city of Nîmes has evidence of human occupation going back a few thousand years, it is the Roman monuments for which the city is best known. Certain features are not only well preserved, they are amongst the finest examples of their kind from the Roman era. The so-called Maison Carrée, for example, is the only remaining Roman temple in the world that is preserved in its entirety. What we today call Nîmes started out as a small, fortified Iron Age village on Mont Cavalier. As was typical of Iron Age villages of this time, it was surrounded by a drystone wall – stone that would later be used by the Romans when they built a wall around their city. Sometime before 28 BC the village became a Roman colony: coins provide the the earliest physical evidence. On these are the abbreviations NEM. COL, which stood for “Colony of Nemausus”, Nemasus being the name of a local Celtic god. During Augustus’ second visit to the Narbonne Province from 16 to 13 BC the city was made capital of the province. As leader of a great empire Augustus lavished a great deal of attention on the region, grandiose displays of self aggrandisement. Often this took the form of spectacular architecture, such as the Nîmes amphitheatre and the wall that surrounded the city. 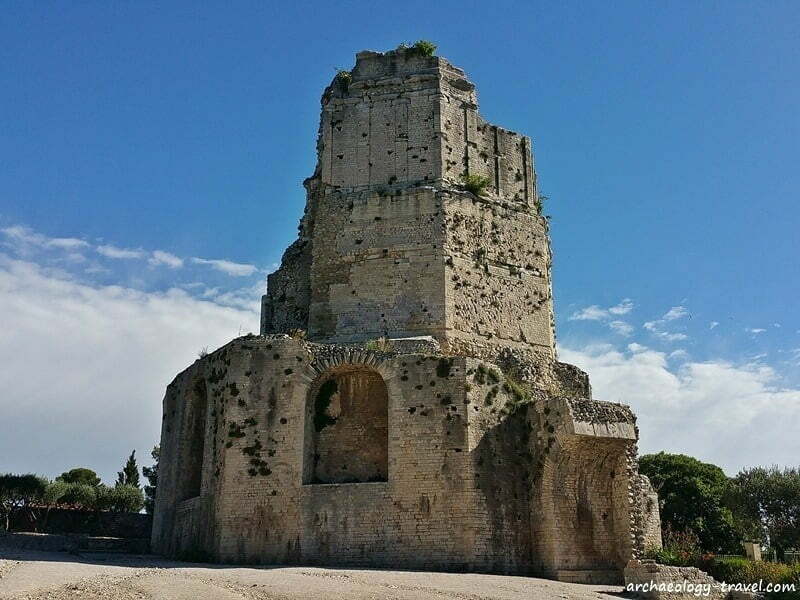 Besides the very visible and spectacular Roman monuments, from records we know that there was a civil basilica, a curia, a gymnasium and there may have been a circus. But none of these have survived, they were probably destroyed during the invasion of the city by the Visigoths in 473 AD. There are a number of less noticeable ancient features not included on our list here, such as the stone walkways over ancient Roman waterways, making Nîmes a wonderful place to explore for people with a passion for Roman archaeology. Nîmes is the administrative centre of the Gard Department in the Languedoc-Roussillon region of southern France. The yellow markers indicate the various remains that once made up the Roman city wall. The blue markers are the two museums with Roman displays, while the red markers are the other Roman attractions. One of the best preserved amphitheatres surviving from the Roman World. The amphitheatre is roughly contemporary with the Colosseum in Rome. 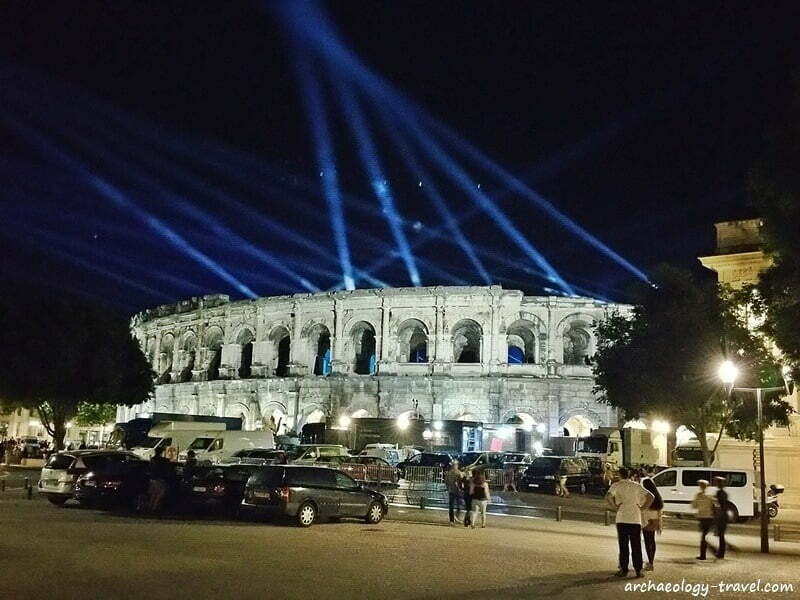 The Nimes Amphitheatre is said to be the best preserved amphitheatre from the Roman era, and is still used for various events today. 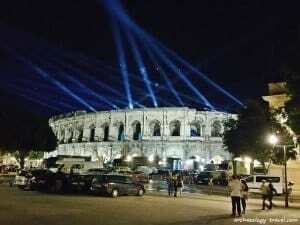 In Roman times the perfectly shaped arena had a seating capacity of 24,000 people. Besides the complex architecture, bas relief sculptures are well preserved. The Maison Carrée is the only Roman temple to be completely preserved. The temple was built by Augustus, and dedicated to two of his adopted sons – Caius and Lucius. It was placed on a podium overlooking the forum, the city’s public gathering place, and it was from the podium that public announcements were made and public ceremonies performed. By virtue of its size the temple would have dominated not only the forum, but also the city, reminding locals of the rule of Rome. As with many Roman cities, Nemausus was surrounded by a defensive wall, consisting of ramparts and circular towers. The surviving features of the city wall are indicated by the yellow markers in the map above. The ramparts here were not only the longest in the province of Narbonensis, they were also the thickest. It is thought that the towers were about seven metres in height, and unevenly spread along the ramparts around the city. The Roman tower is on one of the highest points in Nîmes. The Tour Magne (great tower) is the most substantial surviving feature along the wall, rising today to 33 metres; it was as much an expression of status and political power as it was a functional and defensive structure. There are in fact two towers – an older prehistoric tower inside the later Roman tower, the first (18m high) is what remains of the defensive structure of the Iron Age settlement. A more grandiose and much larger tower encloses the prehistoric tower. There are two surviving city gates from the Roman wall. The first, Porte de France, is a single arched gate. Porta Augusta, the second, is a much more substantial surviving gate, with four entrances – two for pedestrians and two for vehicles. An inscription reveals that this gate was constructed in 16 BC on the orders of Augustus. It was built on the Via Domitia. The 18th Jardins de la Fontaine, with its extravagant arrangement of palisades and statuary, were built on the site of the sacred spring that was dedicated to the Celtic god Nemausus. And it was here that the Romans later built their nymphaeum, a shrine to the nymphs of a spring, which still flows today. The more recent gardens were intended to celebrate the Imperial past of the city of Nîmes. Left untouched during the eighteenth century makeover was what has come to be called the Temple of Diane. According to local folklore the impressive ruins are those of a temple dedicated to Diane, goddess of the moon. Emperor Hadrian is also credited with its origins. But general opinion is that it was in fact a library, based on the Celsus library at Ephesus in Turkey. Next to the walls of the 17th century Citadel is the Castellum Aquae. This is the basin at which water coming from the aqueduct, via the Pont du Gard, would have been distributed through 10 supply channels to bath houses, public fountains and privileged households with running water. This castellum divisorium is particularly well preserved, and one of only a few known of its type (another can be seen in Pompeii). The circular tank has a diameter of 5.9 m and a depth of 1.40 m.
There are two museums in Nîmes with collections of Roman artefacts on display (blue markers on the map above): Musée Archéologique and Musée des Beaux Arts. The archaeology museum has exhibits relating to all periods of the city’s prehistory. This is a traditional museum, but work has begun on a new museum next to the amphitheatre. The fine arts museum has the beautiful Admetus Mosaic, 50 square metres of scenes from the Greek myth of Admetus and Alcestis. Some of the points of interest indicated on the map are on the streets or in the gardens and you can visit these at your leisure. Other attractions, including the Magne Tour, the two museums and the amphitheatre, have more restricted access – check the websites listed below for further details and practical information for visiting these attractions. When visiting the Arènes of Nîmes bear in mind there is quite a bit of climbing to tour the entire amphitheatre. But take your time and take advantage of the self-guided, audio tour – it is excellent and included in the cost of the entry ticket. Visiting during the summer months will enable you to get yourself a ticket to one of the many and varied public events (including Roman-themed re-enactments) that are stages in the amphitheatre, and get another feel for what these buildings were like. You should bear in mind then that there is scaffolding and seating in the arena that is not original, and some feel detracts from seeing the amphitheatre as it should be. Don’t miss the Jardins de la Fontaine with its water fountains and statues, as well as the Temple of Diane. Walk through the gardens to the Tour Magne, which is located on a high point in the city and therefore has some wonderful views over Nîmes. Sometimes there is quite a queue, but the views on a good day are well worth the wait. And of course, if you are in Nîmes you do not want to miss the Pont du Gard (north-east of the city), the bridge that carried the aqueduct over the Gardon River to Nîmes, and widely accepted to be one of the finest examples of Roman engineering. A guided tour with professional operators can be a great way to get the most out of your visit. Staying in or near Avignon gives you access to three very different tours that include Nîmes. How about a Private Tour of Roman Sites in Provence, during which you will visit the Roman aqueduct on the Eure River, the Pont du Gard and many of the Roman points of interest in Nîmes. Or, take in both Roman and Medieval sites on a Small Group Tour of Nîmes, Uzes and Pont du gard. For something quite different there is the option of a full day tour of Provence’s Gastronomic and Historical Heritage. Besides visiting the Medieval villages of Les Baux de Provence and Uzès, and the Roman town of Nîmes as well as the UNESCO site of Pont du Gard, this tour also includes a visit to an olive oil mill and a vineyard for tastings at these. Southern France Oxford Archaeological Guides by Henry Cleere.